This is a review of a new binary options scam called “GPS Trader”. It is presented by Richard Heffner. Heffner claims to be the CEO of GPS Trader. His binary options trading software can allegedly make you $850 per hour, $20,000 per day, risk free. It allegedly is based on GPS satellite technology. According to Heffner there is only a 48 hour window to get the GPS Trader license for free. Then you can set the software to auto trade and wait for profits to come. Let’s start by explaining how GPS Trader really works. Heffner (or Hefner in the trading app) is a fictitious character played by a paid actor. The only purpose of this project is to make you deposit money with a certain broker, because these scammers are affiliates and will get paid for this. This is how they make money, they earn affiliate commissions on new depositors they refer to their partner broker. You should know that it is a scam from the moment you hear that it will make you $20,000 per day for free, risk free. Not to mention the stupid claim that satellite technology is faster to transmit data than cables on Wall Street. So the first thing that is obvious by now is that GPS Trader is not free. You won’t be allowed to use it until you deposit at least $250. So you will have to be risking your own money since the first trade. And you can be sure that the software is worthless and will lose your deposit. After you sign up, Heffner shows you an allegedly live trade that makes your balance grow from $50 to $88. But the balance and the trade are absolutely fake. This is a dirty trick used by many binary options scams, they show you fake trades and fake results. Look at the image on the right, after the fake trade you are taken to a deposit page where you can clearly see that your real balance is $0. In reality the GPS Trader software is far from unique. It is exactly the same app as used by the Cloud Trader or Insured Outcome scams for example. You can look at our reviews and see that the dirty trick with the fake live trade is exactly the same, it is the same software. 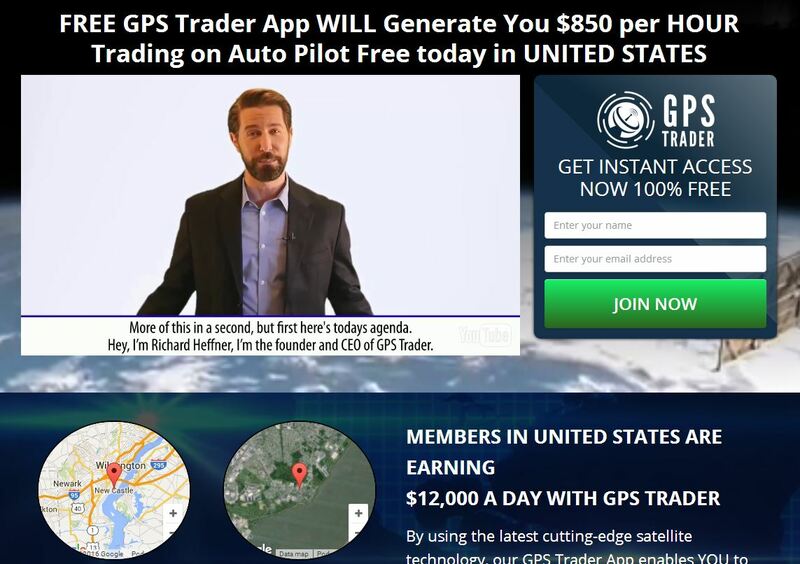 GPS Trader is a rebranded scam that is using lies to take money away from you. Poor binary options, they get abused by scammers probably more than any other trading tool. If you want to see how binary options really work and how money can be made in trading, try a free demo account. And be sure that anybody promising you free money, but asking you for a deposit first, is a scammer. I read your review and appreciate it. Since you know those that are scams, do you know one that is legit that you can recommend to me? I am interested in doing this, but I do not want to waste time and money. If you know of one you can recommend to me where I can trade legitimately and honestly, please let me know. I would appreciate your input if you could e-mail me this information. Thanks. Hi, unfortunately I don’t know about any profitable robot or signal service. The only way leading to profits that I know about is learning and manual trading. Hi, we did a review of OptionBot 2 back in 2014. I don’t know if it has changed since then, but I doubt. The difficulty with BinaryOptionsWatchDog is that they mix real reviews and fake reviews, they promote a lot of scams for money. Thanks again for your honesty. I noticed a comment at the end of your review on XE Trader, but it sounds as if you have never found even one trustworthy yet. I am 70 years old and know nothing about currency trading, but don’t mind investing a few hundred dollars if I could find something that would allow me to learn and paper trade before I jump in and spend the money. I would appreciate and follow any suggestion you may offer. Thanks again. Hi, I think the best thing is to invest learning. By that I don’t necessarily mean money. I always say that a good starting point is Babypips.com. Trading spot Forex and binary options is very similar. You can get a free demo and play and test ideas. I think there are no shortcuts. Hi Leo, Porter Finance is a broker, but unregulated. We always recommend to trade with regulated brokers only, because they offer greater safety when it comes to deposits and dispute resolution. Hey John i was thinking about joining GPS Trading but started to feel uncomfortable about it all..i decided to google it and as i thought it was a scam thanks to you…it is wrong to fleece people out of their money ..Thank you for your input you have saved me from doing a big mistake..
Hi John, I am taking your advice on NADEX and am very excited about learning all I can about this. I am watching all the training videos they offer, and I am going to start with a demo account as you suggested, however, I am overwhelmed by all the trading possibilities it offers. Should I just choose one such as gold or else a currency and concentrate on learning how to trade just that, or should I be more diversified? Is there a particular option or currency exchange that you might recommend to begin with? Thanks again, and you have been a tremendous help in getting me started. Hi, yes, it might be better to concentrate on a few assets (4 or so). Commodities and stocks should be a little bit more predictable than currencies. On the other hand you can find strongly correlated currency pairs that move in a similar way, so intermarket analysis can help to predict future movements. The choice also depends on your trading hours. Hi John, I wanted to run something by you. I ran across a program by Mike Freeman called NEO2. You probably have already seen this, and although it looks interesting to me, you may already have it labeled as a scam. If so, just let me know and I will not waste any more time pursuing to learn about it. You have me scared of any program that uses predictions, however if you really think about it, any trade is a bet. I am now primarily concentrating on Gold and the EUR/USD since the dollar and gold share a negative correlation. I have found MACD to be a very useful tool in mapping up and down movements. If you know of any other indicators that would be useful, I would certainly appreciate your input. Thank you as always for your great knowledge. Hi, see the Neo2 review. Concerning indicators, I think it is very individual, use what helps you to achieve a good win ratio. I personally don’t use any indicators, just support and resistance lines. Thanks John, you’re the best!